SACRAMENTO, Calif. (KGTV) -- California organizations and prominent businesses leaders are rallying support to repeal part of Proposition 13, a landmark vote that limited property taxes statewide. The portion organizations have taken aim at would leave property tax protections in place for homes and residential properties, but would substantially increase taxes on commercial property, creating a so-called “split roll,” according to the Sacramento Bee. A group that supports the initiative to change Prop 13, Schools and Communities First, has gathered 860,000 in an effort to get the measure on the November 2020 ballot. The state’s Legislative Analyst , Mac Taylor, concluded that the changes most years would result in an additional revenue of $7 to $11 billion. Proposition 13 was passed by California voters in June of 1978 and limits property tax. Prior to the passage of Prop 13, each local government throughout the state could set its property tax annually. This meant the average rate throughout California was nearly three percent. Under the proposition, a property’s overall tax rate statewide is limited to one percent. Taxes on property are already one of California’s largest sources of government revenue, raising $55 billion in the 2014 to 2015 budget year, according to the Legislative Analyst’s Office. 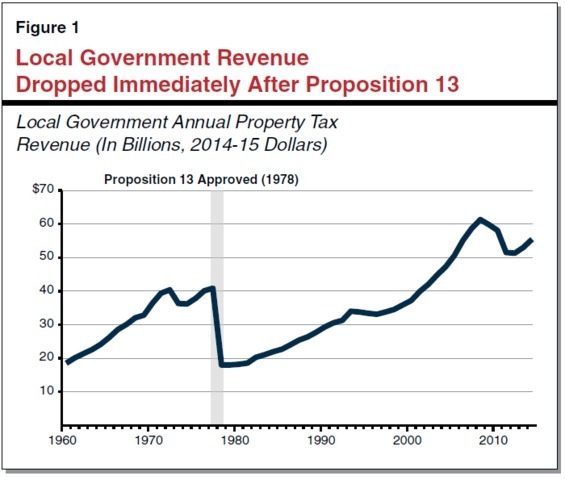 The chart below paints a picture of what happened to tax revenue following the passage of Prop 13 as well as revenue in recent years. One of the reform’s biggest proponents, The San Francisco Foundation, says the revenue could be used for schools, health clinics, infrastructure and other community services. Groups like the California Chamber of Commerce, however, oppose the plan split roll plan. The chamber says higher commercial taxes would be passed on to consumers. The CalChamber board added that, if changes to Prop 13 pass, they fear local governments would move toward approving commercial retail development instead of badly-needed housing developments.